Sausage Party was an adult animation flick truly deserving of an R rating (pervasive language, drug use, and very strong sexual content). As mentioned in the video it is a movie definitely not meant for kids (any one who takes their kids to this, is considered a bad parent in my book). 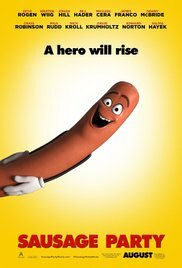 Even so, Sausage Party had a good story and was comedic all around. The thing I didn't mention in the video review is that the swearing got old really fast. I also would of liked to see more of the food outside of the super market and the life outside. Those in the cast include: Seth Rogen, Jonah Hill, Michael Cera, James Franco, Bill Hader, Salma Hayek, Nick Kroll, Edward Norton, Kristen Wiig, Danny McBride, Craig Robinson, Paul Rudd, David Krumholtz and many more others as different fruits, vegetables, and non perishables.